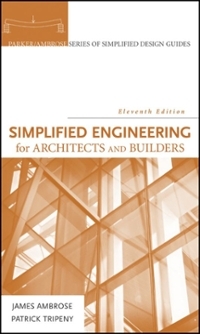 Simplified Engineering for Architects and Builders 11 Edition The classic reference for structural design and construction—completely revised and updated Approaching its eighth decade as the industry leader, Simplified Engineering for Architects and Builders remains the reference of choice for designers and constructors. This new Eleventh Edition is thoroughly revised and updated to reflect the latest practices in the design of structures. Long considered a standard in the field, this perennial bestseller provides a clear, accessible presentation of the engineering information that is essential for architects and builders. Offering a concise, highly readable introduction to the investigation and design of ordinary structures for buildings—including information on structural analysis, materials, and systems—this thoroughly updated Eleventh Edition includes: The latest building and material codes A fresh look at the LRFD method as well as the ASD method of structural design A revised section on the principles of structural mechanics for the latest generation of designers and builders Essential formulas for the solution of structural problems More than 200 descriptive illustrations A companion Web site that now provides access to the Study Guide to Accompany Simplified Engineering for Architects and Builders An unparalleled resource for students and professionals in architecture, construction, and civil engineering, Simplified Engineering for Architects and Builders, Eleventh Edition boils structural engineering down to its essentials and provides the simple design solutions that are used for the vast majority of buildings.